For security reasons: full name, email, field of work/study andcompany/institution are required at time of purchase. All proceeds to PROJECT: slingSHORT will be donated to charity. PROJECT: slingSHORT, scheduled on 25th November 2007 will be supported by The Singapore High Commission in London and Objectifs Films. 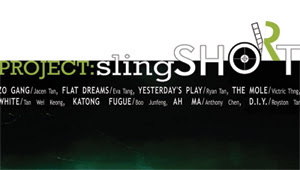 Once again, upand coming Singapore filmmaker, Boo Junfeng will curate a line-up ofSingapore short films. This event will also be a launch platform for two complete unknown short filmmakers, one based in the UK and the other fromSingapore. Following the screening there will be a Q&A session with some ofthe filmmakers. Come meet some of the filmmakers at the pre screening reception. The Singapore Wave - SOLD OUT!